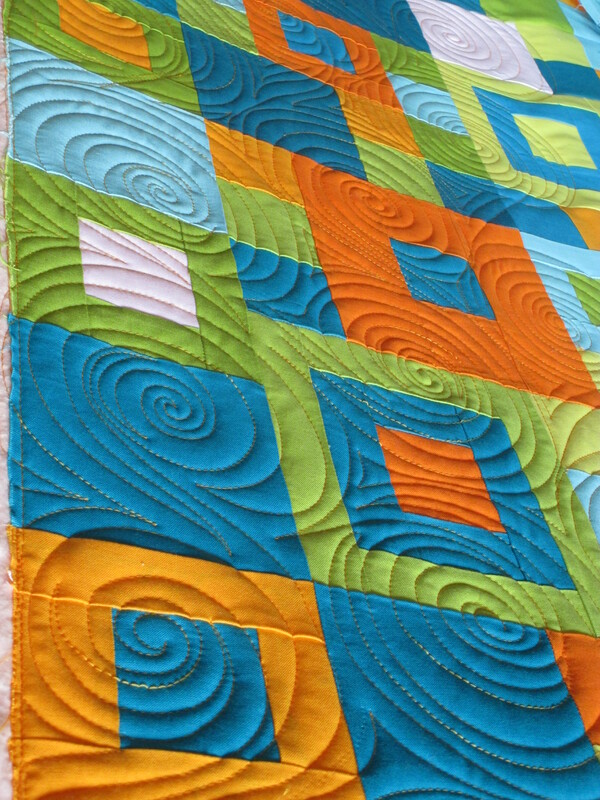 First off, let me show you the quilting that didn’t show up on Jackie’s Quilt post. Stitching this Pantograph was so easy peasy I felt guilty charging Jackie for the quilting. 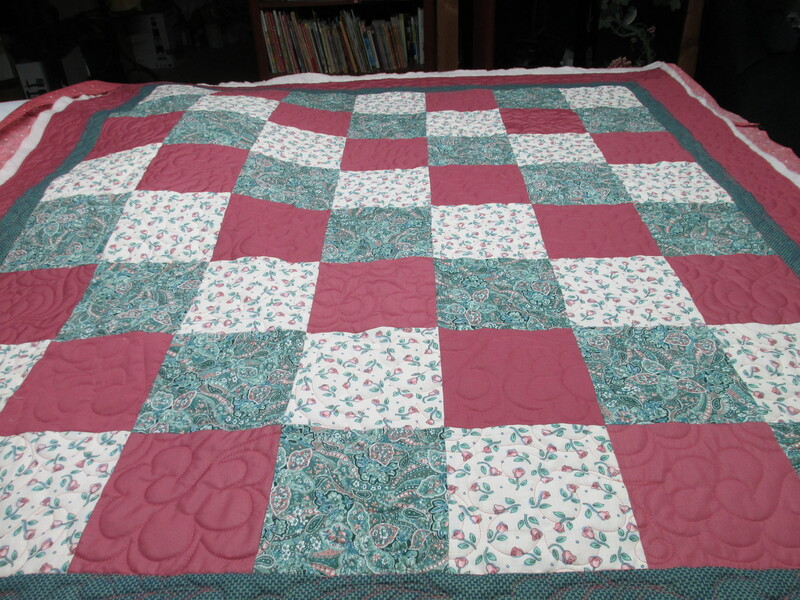 After I finished her quilt, I caught up on this charity quilt that I haven’t been able to get to in a couple of months. At this point, I just wanted to finish it, so I opted for a quick edge 2 edge design and then failed at attempted to add a matching border. It turned out okay. Not happy with the border, but it’s done. Our guild has a charity sewing day every February. Kits are made up for us to piece together and then to quilt. I was hoping for a bigger quilt, but this is what I was given, and it’s just as well since it’s taken me this long to finish it. 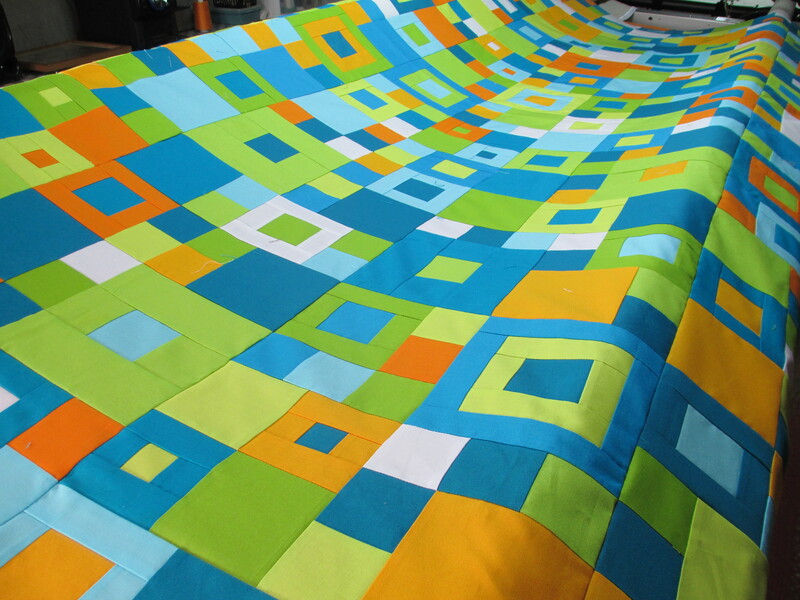 What I am currently working on is the following quilt. My new favorite kind of fabric is solid colored fabric. 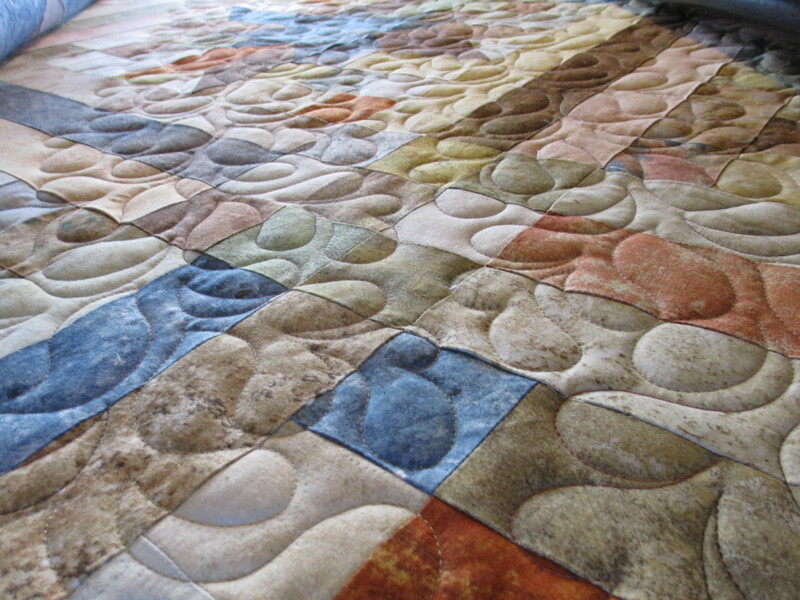 I love the colors in this quilt and how they pop against each other. Jackie says her daughter, Kat, can outquilt her any day. 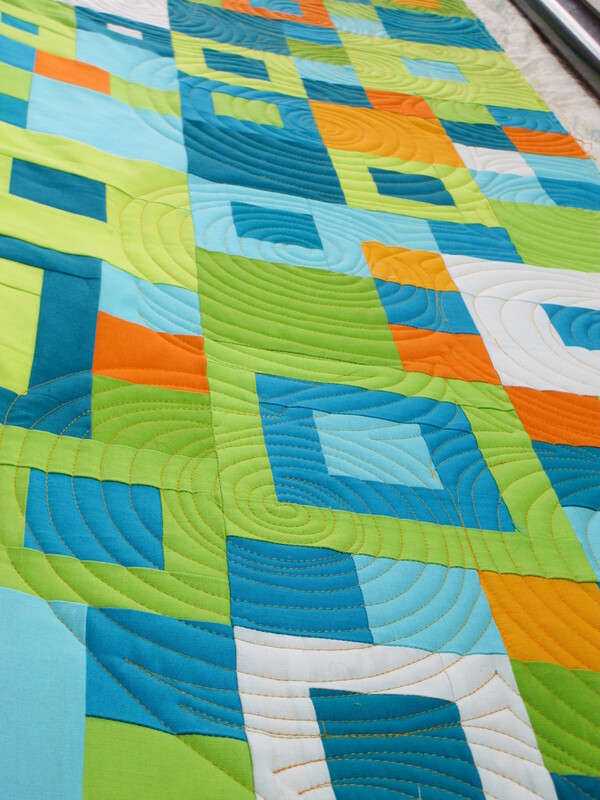 I don’t know about that, but I do love this quilt Kat put together. 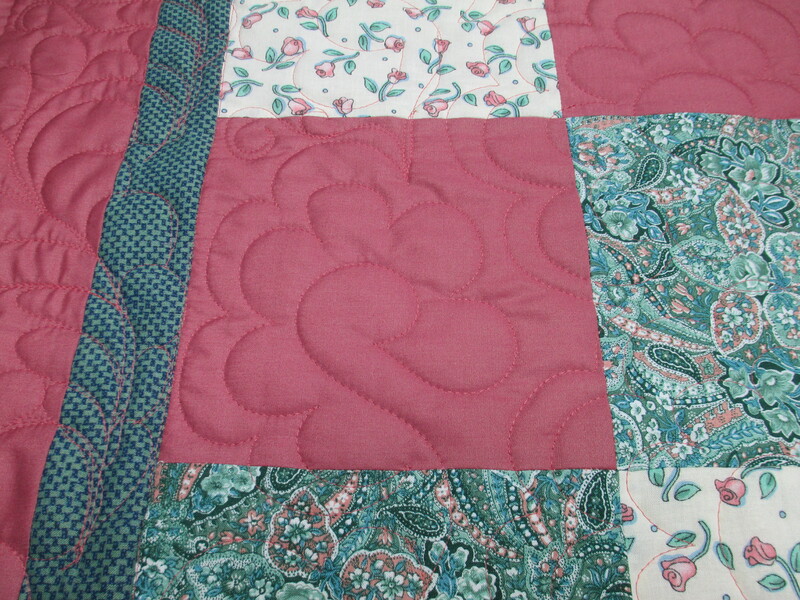 She just wanted circles quilted all over it to break up the squares, so here is what I’ve done so far. The thread is a light orange – I think this was a good choice on the customer’s part. As for the circles… my circles aren’t perfect – they are done freehand. I like the circles against the squares, another good choice on the customer’s part. I’m always impressed with my customers’ choices. I learn a lot from their tastes and their styles. I’ll post more pictures when I am done. Which is it? Square peg in round hole? Or round peg in square hole?